Category : Amateur Transmitter/Receiver (and Transceiver) Storage Battery for all (e.g. 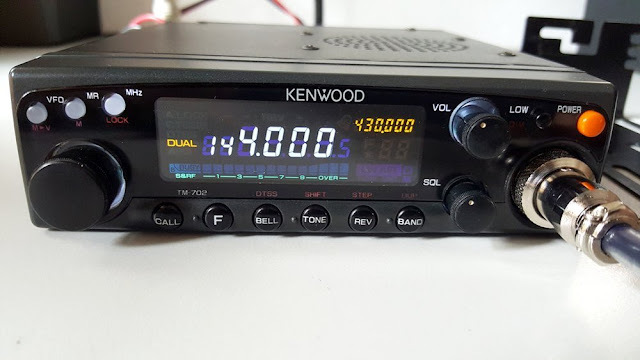 for car radios and amateur radios) / 13,8 Volt Permanent Magnet Dynamic (PDyn) Loudspeaker (moving coil) Model: TM-702E - Trio-Kenwood Electronic Inc Miscellaneous shapes - described under notes. Range: 144···146 MHz and 430/440 MHz Pout: 25/25 W; 25 memories, CTCSS. VHF/UHF transceiver Frequency range: 144-146 / 430-440 MHz Mode: FM RF Power output: Hi: 25/25 W Mid: 10/10 W Lo: 2/2 W Sensitivity: N/A Selectivity: N/A Image rejection: N/A Voltage: 11-16 VDC Current drain: RX: Max 1.0 TX: Max 5-7 Impedance: 2 * 50 ohms Dimensions (W*H*D): 140*40*200 mm Weight: 1.4 Kg Manufactured: 199x-199x Other: 25 memories. Impedance: 50 ohms / 2*?